Gareth Lovett Jones is promoting his new novel The Wind In The Pylons by bike. The first volume of the book, an ingenious satire on the state of modern Britain, and a ‘sequel’ to the The Wind In The Willows, relates the modern adventures of the much-loved character Mole who, during Part II of the story, cycles across south-east England from Berkshire to Suffolk. 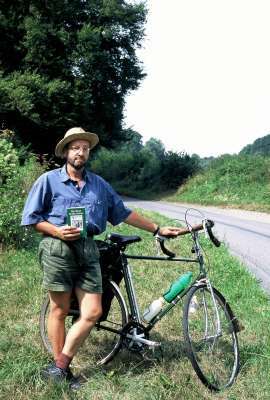 Gareth has recently completed a cycling tour following the same route - stopping at various towns on the way to visit bookstores. He is also visiting bookshops in the Thames Valley area – not too far from home, since he himself lives near the reach of the Thames where Kenneth Grahame made his final home. It was in this same spirit that Gareth sought a small, independent publisher at the outset. Hilltop is striving to keep the idea of independent publishing of serious fiction alive in the UK in a period of “rationalisation” in which even the longest-lived and most venerable British publishing houses – John Murray and Harvill Press are recent examples – find themselves being hoovered up and embalmed as mere imprints of conglomerates. Tel. +44 (0)1844 238692. Contacts: David or Catherine Croydon.